2009 December — I See Hawks in L.A.
LOST HILLS REVIEW: I SEE HAWKS LIVE IN L.A. Being stuck in L.A. for a couple of weeks can be trying, but it also has it’s bright spots. There are listenable radio programs here, readable free tabloids and world class live music any night of the week. I always gravitate to the Cinema Bar (the oldest bar in Culver City, as they say) because it’s free and because it’s a good scene. They book the coolest Alt.Country/ Americana acts around and the patrons are mellow and down to earth. Beers are six dollars and the stage is right in front of you. Went down to see I See Hawks In LA and, brothers and sisters, they made a joyful noise. I bought two of their albums about a year and a half ago and had them in my truck’s cd player for months, but I never had the chance to see them live before. Their albums are great, but I think you really have to see this band live to grasp what they’re all about. They’ve been touring and they were very tight, creating their hawk world for the home crowd in this cool and intimate space. Their songs are humorous with surprisingly deep undertones, their sound is a seamless blend of classic country and psychedelia, and their musicianship is top notch. Front man, Rob Waller plays acoustic guitar and is warm and engaging on lead vocals. Shawn Nourse is an impeccable beat master on the drums. Bassman, Paul Marshall, a veteran of the Thirteenth Floor Elevators, is a real pro and an outstanding singer and songwriter in his own right. Lead guitar player, Paul Lacques is mind blowing. If there’s a lick that he doesn’t know, then no one else knows it either. 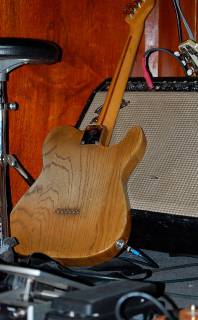 Leo Fender invented the Telecaster and the Deluxe Reverb Amp just for Paul to do his trip with. They’re a fun band to see live, and you can’t avoid having a great time. The Cinema is great because it’s the real thing. You’re standing right in front of the band hearing and feeling the guitars straight from the amps and the drums directly from the sticks. The Hawks sometimes have lots of instruments on their albums, and sometimes play live with pedal steel, fiddle, etcetera, but this night it was just the four of them, and that’s probably the best way to hear it. It worked for me. Albums are great, but you really get to know a band by seeing them live. I had a chance to get to know a great live band, and get to know L.A. a little better, too. The Grapevine will never be the same…..
Email us here to get on the email list. Look for a confirmation email and click the link in it.